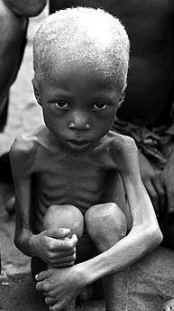 Although having many layers of complexity, to most observers the reason we have world hunger is because of poverty. While on its simplest level this is true, animal based food production systems are directly responsible for many factors affecting hunger, starvation—and even poverty, which then, cycles itself back to hunger... Realize that 82% of the world’s starving children live in countries where food is fed to animals that are then killed and eaten by more well off individuals in developed countries like the US, UK, and in Europe. One fourth of all grain produced by third world countries is now given to livestock, in their own country and out. So, how would conversion to plant-based, local agriculture systems change this? Hunger and poverty, in many cases, exist as a circling phenomenon, whereby one perpetuates the other. Addressing the hunger issue will help solve the poverty issue. It has been shown that growth in the agricultural sector of a developing nation is two times more effective than growth in any other area including economics. There are two primary groups of people suffering from this poverty-hunger cycle—about 33% are those living in more urban settings (this is the case with those found in the U.S. and other developed countries), while the other 2/3 are those in rural and more undeveloped nations. For both groups, the raising and eating animals (livestock and fish) by our global community ultimately affects food prices, food availability, policy making, and even education to improve agricultural systems in those developing countries. Global factors include control of seed manufacturing and pricing primarily for livestock feed crops by large companies such as Monsanto and DuPont (Pioneer), buying and selling of grain including futures by Archer Daniel Midland, Cargill and through the processing/slaughterhouses and packaging by Cargill, Swift, Tyson, and JBS. These few but very large and powerful companies control over 65% of all seed, grain, and over 80% of all final animal products in the world. It is a very monopolized production and economic system manufacturing seeds at one end and spewing out meat at the other. Because of the global demand for meat (all livestock), cultural, social, political, and economic influences remain strongly supportive of the continued dominance of these large companies and the meat, dairy, and fishing industries in general, which then drives how global resources are being used (land, water, rainforests, oceans, atmosphere, biodiversity, etc. ), how money is spent, and how policies are determined. The demand for animal products in developed countries drives resource depletion in developing countries as well as exacerbating poverty and hunger.